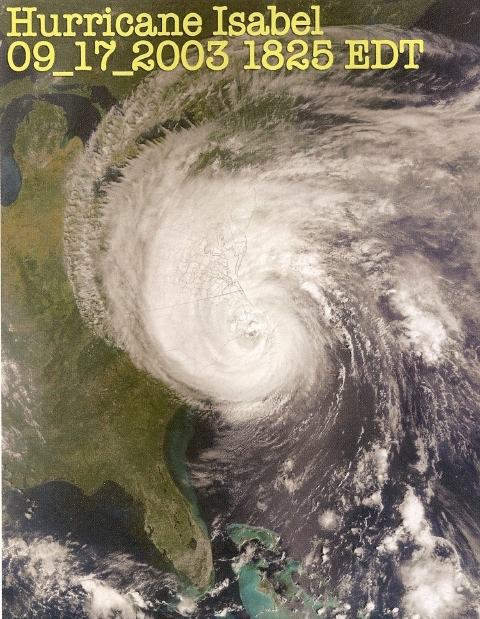 crossed the Outer Banks of North Carolina on September 18, 2003 with wind speeds of 105 miles an hour, a Category 2 storm. 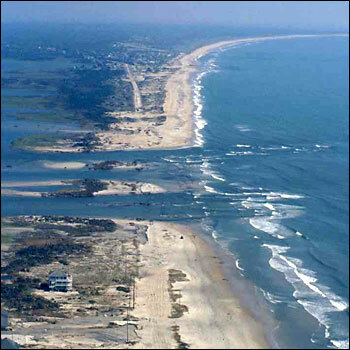 The storm surge that built up in lagoons behind the beaches cut Hatteras Island in two, forging an inlet almost 2000 feet wide and crumbling NC Hwy 12, the major road, on the barrier beach. For two months, until the inlet was closed with dredge spoils and the road was rebuilt and ferry service resumed, residents lived in virtual isolation. This massive rebuilding cost five million dollars, the largest single chunk ever spent on Hwy 12 to repair storm damages. From the time we noticed Isabel’s first drizzles and puffs during a spirited pre-hurricane party until the last blows died away, more than 24 hours would elapse. Most of the damage would occur during a scant two hours in an afternoon when the world seemed to go wild. We will not go to another hurricane party. Still, we were ambivalent about Isabel. Her eye alone was 40 miles wide. At sea, her wind speeds were as high as 165 miles an hour, a Category 5. 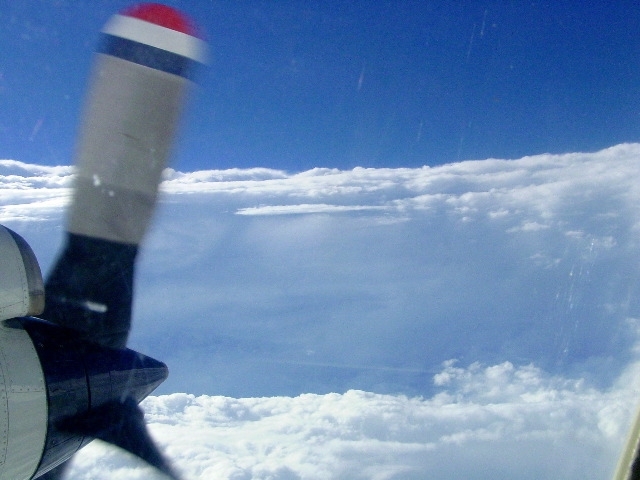 On September 13th Hurricane Hunters measured an instantaneous wind speed of 233 miles an hour, the strongest ever recorded in an Atlantic hurricane. Then she teased us by weakening to a Category 2. Surely, by the time she reached us she would be just another blip in weather annals. We had heard rumors of mandatory evacuation, but nobody paid much attention. It was a foregone conclusion; we were staying in our home. 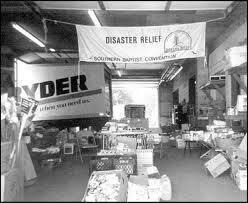 We had always stayed home during hurricanes. Most everyone stayed home. So we stayed. And Isabel slammed into us, like one of the Valkyries come to do battle. 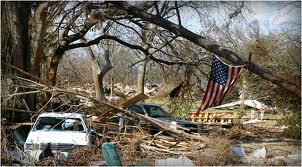 She cut a swath of devastation at least a hundred miles wide. 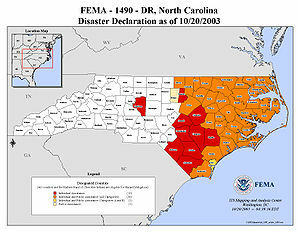 Thirty-six North Carolina counties were declared disaster areas. they were torn apart. Severe tree damage gave testimony to violent winds. Such anecdotal observations never became part of the official records. We rode the eastern shoulder of Isabel’s eye for a day. The respite from howling winds that the center of an eye might have brought would have felt like a luxury to us. The 3-foot storm surge that coursed through Albemarle Sound became 12 feet by the time it funneled into Edenton Bay and pummeled the town’s waterfront. Homes were torn apart. Elsewhere, grand old landmark trees lost their moorings. Such fury had not been seen in a lifetime down here. The storm that should have fizzled didn’t. beverages were prohibited. Emergency shelters were crowded. Local radio stations, comforting lifelines to the outside world, broadcast breaking news nonstop. Thousands of ready-to-eat meals were served. Bottled water and ice were distributed. And we realized we actually needed some of this help. Schools and businesses had closed a day or so before the storm so people could be prepared, but we thought that was meant for other people. So we were not ready for the sudden loss of water, power, and phone. In retrospect, we should have filled the bathtub with water. As it was, we had only a couple of empty liquor bottles filled with good water, one flashlight, no spare batteries, and a radio borrowed last minute which worked only when we put the batteries from the flashlight in it. And how we longed for a shower, defying even strict curfews to sneak one at the home of a luckier friend thirty miles away. Of the three, water, power and phone, water was the worst to lose. The community spirit and helping hands that came out of the rubble buoyed spirits and made these inconveniences manageable. Nobody complained. We truly counted our blessings that we had had only minor damage. The entire distribution system of our small electric service cooperative was disabled. 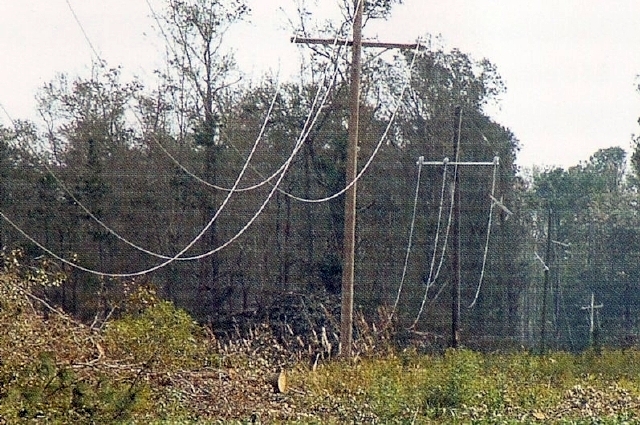 With a thousand miles of line, an average of ten customers per mile, and only 14 linemen on the payroll, rebuilding this service could have taken up to seven years. Like nimble-footed infantry, convoys of power trucks rolled in from across the state and beyond. Ranks of linemen swelled to over two hundred. Spontaneous thumbs-up and V for Victory became de rigueur. Roadside thank-you posters sprouted. We opened our hearts with gratitude to these intrepid linemen. In little more than a week, power was restored; phone and water soon followed. After the storm, blue-tarp roofs and fallen ancient trees told their sad, silent stories. Blue tarps couldn’t help some homes, though. Homes gutted by the pounding storm surge had to be totaled, which involved endless dickering with insurance companies and FEMA. Small claims were settled quickly. Losses of entire homes and their contents required endless rounds of interviews, mountains of proof, written documentation, niggling over flood-zone boundaries, sometimes involving lawyers, as adjusters sought to save their companies’ money and the government sought to save the people’s money. towns and counties. Volunteers with the North Carolina Southern Baptist Disaster Relief Team are trained to remove trees and make repairs and seem to work non-stop during disasters. Members of the Corinth Baptist Church Disaster Relief Team arrived at the home of our hurricane-party hosts shortly after they called for help and removed two large trees from their roof. In true country style, the women of the church volunteered to keep workers fueled with hearty meals. Dollar estimates of losses are impossible to calculate. Value of property loss is central to estimates of storm damage, but it does not begin to tell the full story. The highest estimate we found put losses to the low side of 500 million dollars in North Carolina. Less than $500 million in 36 counties! 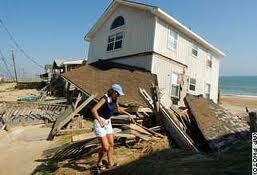 Damages to a much smaller area in Virginia were estimated at almost two billion dollars. Greater population density in Virginia and greater affluence of communities accounted for most of the disparity. Hardest hit in North Carolina were poor counties with low populations. The figures tell the story. In Bertie County, heavily hit, over 80 per cent of houses were damaged. Total losses: about fifteen million dollars. Damages in low-lying Hyde County, where almost every building was flooded: about 13 million dollars. Such small claims kept insurance companies from going broke in North Carolina. more sensational pictures and stories of large homes precariously balanced or sliding into the ocean from Outer Banks strands. Nor did national media discuss losses of timber and crops. About 800,000 acres of timber valued at about half a billion dollars were destroyed. Bertie County sustained more than a quarter of this. Help would be available to stricken landowners through the NC Division of Forest Resources. The state’s largest acreage of cotton, soybean and peanuts felt the winds and rain from Isabel. Cotton crops, already two weeks late maturing, were flooded and tangled in high winds. Defoliation (standard procedure prior to picking) would be difficult. Flooding accounted for most crop damage, which was estimated at about $150 million. Chicken production took a hit of about $160 million. And then there were the fishkills. Isabel’s storm surge had churned up buried pollutants, sediments and decomposing waste. The health of the Roanoke River basin was already teetering from low dissolved oxygen levels during one of the hottest, wettest summers on record. Given Isabel’s insult, oxygen levels plummeted. Sewage systems failed under heavy rains and power loss, pushing dissolved oxygen levels to zero. 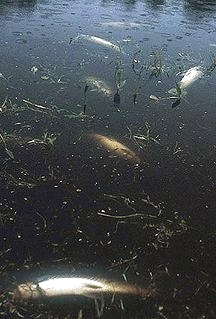 Corpses of fish, shellfish, even insects littered the shoreline. It would take time for this river basin to recover. must finally be plentiful. While the river basin was recovering, blue roofs were gradually disappearing from the landscape. And that’s when life began to get back to normal. To all of you who may some day come face to face with a hurricane, we wish you a sturdy roof that is not blue, a bathtub of water, a good flashlight, and enough batteries to play a radio and light a flashlight at the same time. If you just happen to be worrying about our preparations for the next storm, rest easy. They are all taken care of. When family members up north learned about our flashlight-radio predicament, they chipped in to send us a nifty flashlight with its very own, very large battery. Postscript: The name Isabel has been scrubbed from the list of potential names for future hurricanes. She was one-of-a-kind. Excellent website you have here but I was wanting to know if you knew of any message boards that cover the same topics talked about here? I’d really like to be a part of group where I can get responses from other experienced individuals that share the same interest. If you have any suggestions, please let me know. Cheers! If you are into gardening, check out some of the garden forums on the web. You’ll have to register to ask specific questions, but they are interesting reading. Good luck.